WHAT I SMELL: Madame Hellene is true to the dessert honoring her name as it opens with bright aldehydes and a sweet pear. The perfume is lush, juicy and dripping with a warmed honeyed tone of citrus. It’s also rich, opulent and almost too much to drink in. The pear is nectarous as if it’s coated in simple syrup and it’s also served with a fruity osmanthus. I can’t get over the dizzying spectacle of the whirling fruit and florals which seem to bounce off the skin like whirling dervishes. In a bit the perfume softens, but just slightly as the sweetened florals take on just a bit of powder, which reduces the ripe and wet which led the path at the beginning. After some time, the perfume’s fruity florals are met with a warmed sandalwood and light musk which helps to even the fragrance out. At this point, La Belle Hellene is as pretty as her name and the perfume develops this radiant powder with this delicious hint of licorice which is unexpected, but completely delightful. Licorice notwithstanding, the perfume really starts to dry as it settles down into a powdered memory of ripened pear. WHAT IT SMELLS LIKE TO ME: A lavish dessert buffet. BOTTOM LINE: This pretty lady leaves me rather conflicted. On the one hand it’s too sweet and gourmand for my tastes; at the same time it’s so proper and ladylike with just a hint of licorice making this unique enough to strike my fancy. However, each time I have worn it, it does seem to test my patience a bit as it wears on me and becomes somewhat tiresome. Categories: Parfums MDCI | Tags: 3 bones, chypre fruity, eau de parfum, EDP, Feminine, fragrance, parfum, Perfume, Perfume Review, review | Permalink. WHAT I SMELL: Peche Cardinal opens with a muted berry that’s sweet and fruity and lightly tropical. 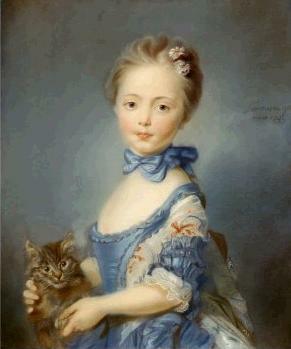 It’s really pretty and soft and could easily have gone big and garish, but instead it is pure innocence. There’s a light creaminess that lends itself to a light peach freshness. It’s as if there are peaches and plums in a beautiful bowl, tinged with sun that’s met with a gentle breeze coming through an open window. Plus it’s cottony soft, like a baby’s blanket; all comforting and secure. After around 20 minutes, the warmth of the sandalwood comes in along with this restrained tuberose, making this even more comforting if that’s possible. 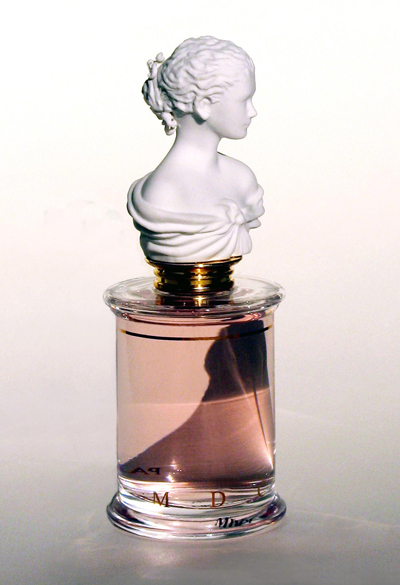 After the 30 minute mark the fragrance begins to grow and increase its projection. But once again, it does so without making it loud. The final drydown is a just a little spicy, but a lot of peach and muted tuberose. Peche Cardinal is one majestic beauty. A fruity floral From a palette of raw materials by the famous Fragrance House Robertet, Amandine Marie imagined for MDCI a very bold, young and vivacious composition: daring at first, but with soft and silky tones in its development. A dazzling start: peach, blackberry, blackcurrant, Davana and coconut make it a true fruity fragrance, full of exuberance. After this grand opening that feels like the triumphant arrival of spring and awakens the senses, lily and tuberose and a touch of plum enter the composition, softening it into a smooth fruity floral. These floral notes are a prelude to the round and velvety final accords of the base: sandalwood, cedar and musk bring soothing calm, body and lasting power. WHAT IT SMELLS LIKE TO ME: The story of a girl’s transformation from beautiful innocence to a sophisticated and charming woman. BOTTOM LINE: Peche Cardinal translates into Cardinal Sin. There is NO sin involved with this fragrance. Instead, it would be a sin not to enjoy it. I’m not a fan of peach fragrances…but I am a big fan of this. Expense: $250 for 75ml EdP without the beautiful bust. $375 for 60ml EdP with the iconic bust. Categories: Parfums MDCI | Tags: 4 bones, EDP, fragrance, fruity floral, parfum, Parfums MDCI, Peche Cardinal, Perfume, review | Permalink. Last week I received six samples that I haven’t had a chance to start reviewing until today. Of course, that didn’t stop me from stealing a quick sniff of each fragrance when I first got the package. The one scent that really stuck a nerve upon first sniff was Chypre Palatin by Parfums MDCI. So when I reached into the package today… that was my first choice. 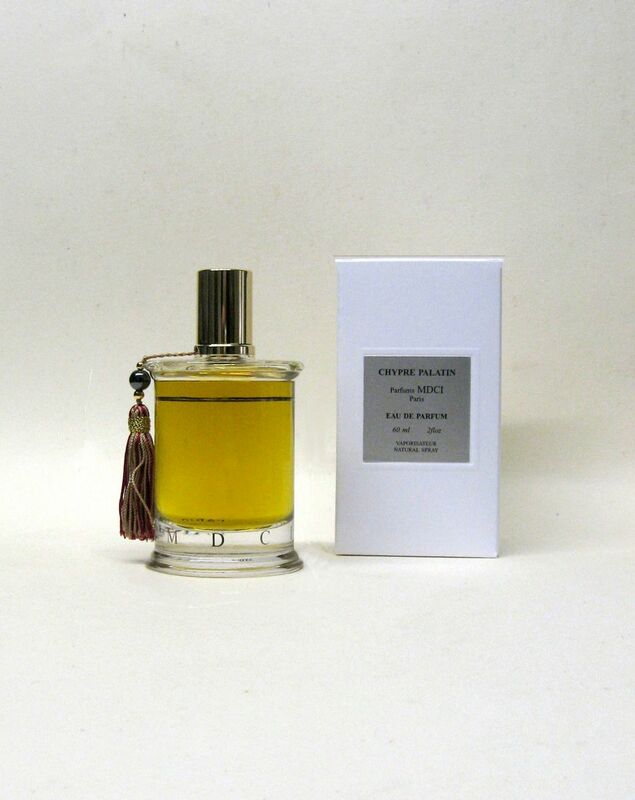 Chypre Palatin’s first offered up a rush of citrus and cedar and then quickly a warm amberish lavender and what seemed to be eucalyptus (but I’m not seeing eucalyptus in the notes?? hmmm). The fragrance goes on very warm without being heavy and it’s very comforting. In a little while the scent then moves to an even warmer almost floral setting. It’s very peaceful and serene. The kind of scent where you want to close your eyes and breath in its aromatherapeutic qualities. As Chypre Palatin continues it’s drydown it moves into a very familiar what I would call barbershop phase. It’s traditional and old world and masculine at this point. But stop, don’t let me confuse you by thinking this fragrance is old-fashioned and masculine. It’s not. The opening and the dry down make it much more universal and modern. In the end, Chypre Palatin quiets down to a nice oak moss and vanilla scent with just a touch of powder. However, depending on what you’re doing, those middle warm aromatic notes will still come to surface as the day wears on. Longevity is average as is the sillage. Chypre Palatin is a lovely surprise that feels old and new world at the same time and I think would be perfect for men and women alike. As I have issues with deciphering the notes from a fragrance with complicated compositions; just note that all the ingredients below make for a perfect fragrance! The surprise comes from the discovery that “Chypre Palatin” is utterly masculine, but could also be one of the most sensuous, voluptuous feminine fragrance ! Categories: Parfums MDCI | Tags: 4 bones, chypre, Chypre Palatin, fragrance, oriental, parfum, Parfums MDCI, review, unisex, warm | Permalink.